Whether you stay one night, a week or more, your Santa Fe vacation rental at Casas de Guadalupe is…. A home away from home with Santa Fe lodging for 2 to 6, including pets. Where you can gather the family around the dining table to plan the day’s adventures in Santa Fe. A special place to embark on an authentic southwestern adventure, just a short walk to the Santa Fe Plaza. Your private place to retreat with all the creature comforts. The warmth of scented pinon crackling in the kiva fireplace. 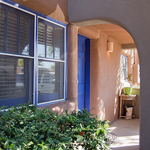 The soft Santa Fe shade under the portal of your private patio. A perfect place to unwind after skiing, hiking, museum exploring or shopping for Santa Fe treasures. The comfort of cooking with family in your own kitchen, or sneaking a midnight snack of leftovers from one of Santa Fe’s many fine restaurants. Where memories of your stay in Santa Fe come to life! We invite you to experience the hospitality of authentic Santa Fe by reserving one of our twelve authentic adobe casitas at Casas de Guadalupe. Welcome to Our Property! Thanks for visiting our website.